You will agree that a patent counsel’s job is not limited to patent prosecution, litigation, and maintenance only. A patent counsel wears multiple hats and plays a key role in strategic planning –in business as well as R&D, assesses present technical competencies of his firm, predicts technological trends in future, and anticipates competitive environment. How their competitors are growing their IP? What strategy their competitors are following for IP coverage? Which technology areas are of high interest to them and in which direction they are seeking more protection? In which regions competitors can restrict them? How do they maintain their patents? Are they more effective than us? 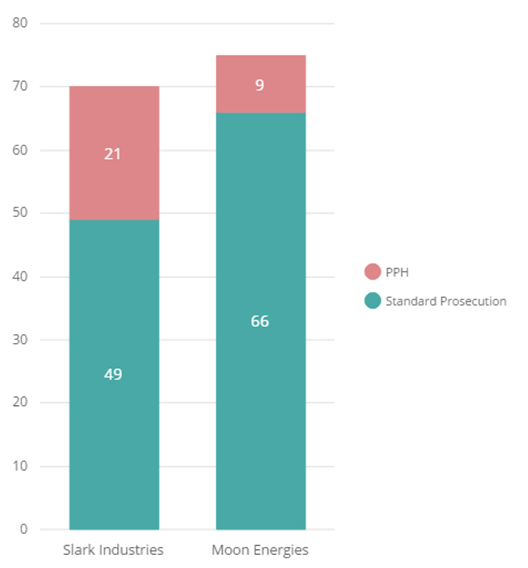 Which mode of patent prosecution do they prefer in different jurisdictions? Growing a company’s portfolio in the right direction is one of the prime responsibilities of an IP counsel. Having a strong and wide portfolio helps a business in expanding their reach both technologically and geographically. But, in-house development of IP leads to a strategic and planned IP portfolio and can be a time-consuming practice. Companies, to rapidly expand their portfolio, opt for acquiring already existing IP. There couldn’t be a better example for this than Xiaomi, one of the largest China-based smartphone manufacturer. 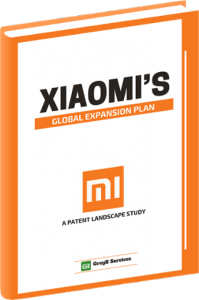 If you look at Xiaomi’s patent portfolio, you’ll see that more than 70% of patents in their entire portfolio have been acquired from different companies. This gave them enough strength to expand their reach in countries other than China which, after looking at their current status, was surely a successful move. Now coming back to our topic, IP counsels can check what practices their competitors are following to grow their IP, and can check if they need to modify something in their own strategy. For example, here’s a comparison of two fictional companies from a mutual domain (let’s say Renewable Energy domain) and are direct competitors – Roxcon Corp. and Slark Industries. Roxcon Corp. has acquired many major companies all over the world. However, in comparison, their IP acquisition seems to be pretty less – only 9 patents. It means Roxcon Corp. is interested in acquiring companies for business expansion but for patents they are relying on in-house development. On the other hand, Slark Industries is taking a different approach. 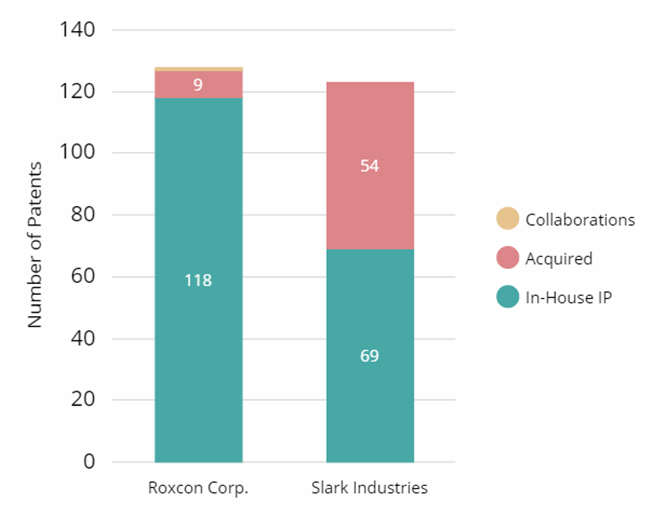 A major portion of Slark Industries’ patent portfolio (~40%) appears to be acquired from other companies. This acquisition put their patent portfolio par to that of Roxcon Corp.
Roxcon Corp, if wants to stay ahead, should increase its patent filing or can acquire patents which it’s shying away from. Such early indicator not only helps companies boost the strength of their patent portfolio but also help them have an upper hand by planning at the right time. Knowing where your competitors are planning to expand their business is another metric that can help you pre-plan your patent and product strategies. This can help IP counsels in multiple ways including finding and filling the geographical white spaces that their competitors have picked up in the recent time. 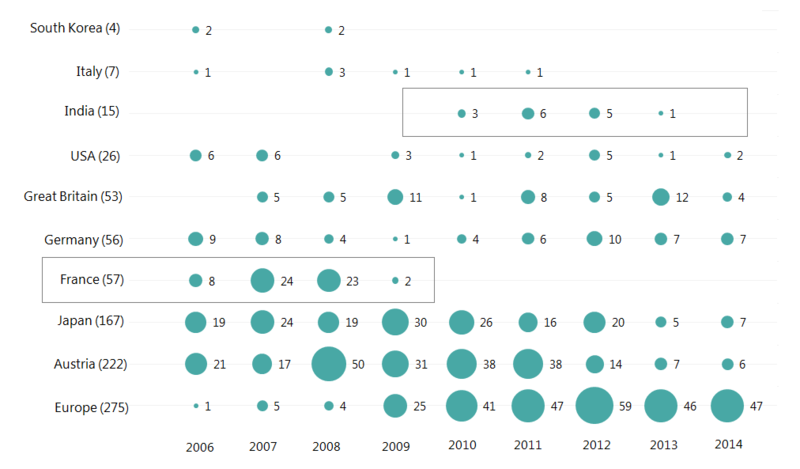 After having a look at the above chart, one can see that after 2009, Roxcon stopped its patenting activities in France whereas a surge could be noticed in the number of patents filed with the EPO. Now one might wonder – Is it a filing strategy adopted by Roxcon, where Roxcon is filing for protection in France via EPO? Also, if that’s the case why are patents still being filed in Germany? The change cannot be attributed to a shift in patent filing strategy. There are other factors too, which need to be taken into account. In the case of Roxcon, the financial crisis in Europe during the period 2008-2009 turned to be one major factor, due to which multiple companies had to shut down their operations in Europe. As a cost-cutting measure, Roxcon shut down its operations in France and shifted them to India. In the same chart, one can see that Roxcon started filing activity in India after 2009, to protect its Intellectual property in the country. All this would have gone unnoticed, which is a major limitation of static presentations and charts. Not everything is visible or can be seen. 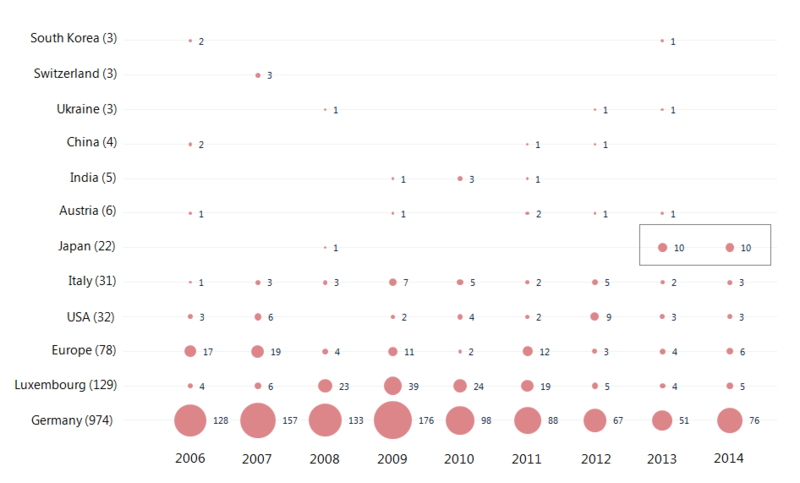 That’s why we offer interactive online dashboards to our clients. It helps them keep a close watch on not only the patent strategy of their competitors but also on their R&D strategies. The dynamic dashboard of GreyB let you slice and dice the data to find correlation and interesting insights that are difficult to spot in static presentations. Would you like to try your hand on GreyB’s Dynamic Dashboard? Click here if you just nodded in affirmation. Hexagon has increased its patent filing in Japan where it could face tough competition from Roxcon that dominates the market. We have an entire article on aligning IP and business strategy of an organization which you can read here: How to Align your IP and Business Strategy? This can be the most important part of competitive intelligence analysis that most of the businesses look for. It predicts future products, product strategy, and verticals where a competitor is headed to. Innovation of a company is always steered by its IP and analyzing a competitor’s IP activity can help predict such information. For example, in the table below, we can see patent filing strategies of Whale Enterprise, Skytent Logistics, and Capsule Corp, in logistics domain. What we find is that Whale Enterprise and Skytent are focusing more on Containers, Transportation facility, and Alternate Delivery Locations as compared to Capsule Corp. which is mainly focusing on Tracking of parcels. It clearly indicates that Whale Enterprise and Skytent will be developing new technologies for delivery of parcels rather than processing of parcels. On the other hand Capsule Corp. is heading towards increasing customer comfort by providing information regarding the location of parcel during transit. Handpicked Suggestion: How IP Benchmarking Can Provide Actionable Insights? This metric can be used for both defensive and offensive purposes. Just like the previous point, IP counsels use this metric to check if a competitor is a threat for them in a particular domain/technology or a country. Taking the previous example, if Whale Enterprise and Skytent want to offer shipments tracking features to their customers, they need to be aware of the potential threat of infringing patents of Capsule Corp. A deep analysis of patents filed for parcel/shipment tracking will uncover these risks to them. Entering in the home country of a company can always be a threat. The same scenario was seen when we compared the patent portfolio of two major players of fast moving products domain – Soap Facilities and Bobble Productions. Bobble Productions has a huge patent portfolio in South Korea. So, it is a potential threat to any fast moving product manufacturing company (including Soap Facilities) if they plan to expand their business in South Korea. However, this scenario is completely different (or even opposite) in the other countries. Soap Facilities beats Bobble Productions in terms of patents in all other countries except South Korea and can be a threat to Bobble Productions if they decide to expand beyond Korea. Analyzing weak and strong areas of competitors will help in making business decisions related to expansion in different countries or even technologies. Note: The numbers mentioned above don’t represent original data and are used for explanation purpose only. Taking the first example from Renewable Energy domain again, on the table above, Moon Energies has way more lapsed patents than Slark Industries. It could be a case that Moon Energies is not paying maintenance fee patents because of a) these patents are less valuable to them or b) they are shifting focus from some of the business verticals/countries. I hope you got the point: exploring the maintenance strategy of a company can reveal many underlying facts. Normally patent applications take 3 years to get granted. However, there is provision for accelerated prosecution where an application can be granted in less time. 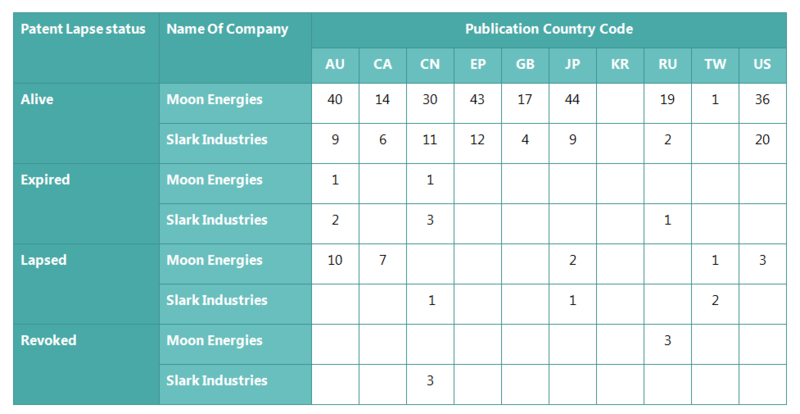 Comparing portfolios of Moon Energies and Slark Industries we observed that in the United States, Slark Industries filed 30% of their patents in last 5 years using patent prosecution highway while Moon Energies opted for Standard Prosecution for the majority of their patents and only filed 12% of their patents under patent prosecution highway. The market potential of US is the game changing factor here and if Slark wants to have an upper hand, it should switch to accelerated prosecution soon. These are not the only 6 ways a patent competitive analysis helps patent counsels in better decision making analysis and making sure that they are on right track. If one digs little further, he can excavate a lot of actionable insights. The question here, however, is: Are you using patent competitive analysis to find such insights?